QE pupils stormed through the early stages of the Bar Mock Trial National Final and drew praise from real-life judges and barristers for their performances. The team reached the competition’s national final after winning their regional round. The event was held this year in the Court of Session – Scotland’s supreme civil court – in Edinburgh’s historic Old Town. Jack Robertson, QE’s Head of Philosophy, Religion and Society, said: “The students were outstanding on the day and can be very proud of their efforts across the year. A number of judges and observing legal professionals commented on how the group’s conduct was exemplary, and that our barristers’ advocacy skills were on a par with qualified members of the bar.” Mr Robertson accompanied the team, together with Chemistry teacher Charani Dharmawardhane. The competition, which is for 15-18 year-olds, involves competitors taking on a number of roles to simulate a real court case, including not only those of barristers, but also of witnesses, clerks, ushers and jury members. Twenty-four schools from across the UK took part in the national final. 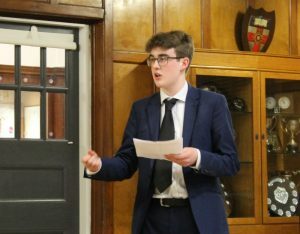 In the first of their three rounds, the QE defence team delivered an “outstanding performance”, Mr Robertson said, winning the heat by several points. 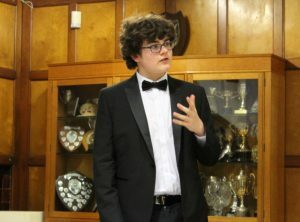 Year 12 pupil Oscar Smith’s highly rated closing speech gave him the top score of any participant in that particular trial. 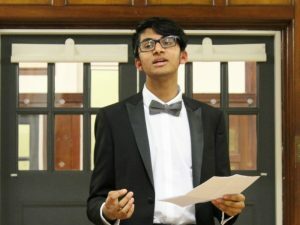 QE also won their second heat, with Rivu Chowdhury, of Year 12, conducting an “incisive cross examination” of the prosecution witnesses. In their third round, QE lost by a single point. 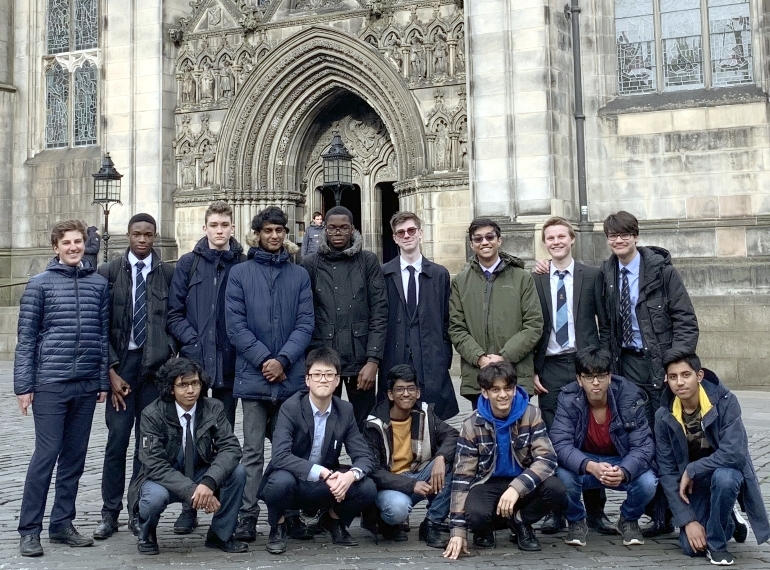 Nevertheless, one observing legal expert applauded the skill which QE barristers Hector Cooper (Year 12) and Yuvan Vasanthakumaran (Year 11) demonstrated in their advocacy. 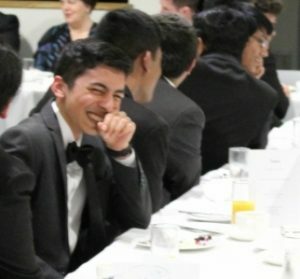 Jonathan Perry (Year 12), who played a timid student accused of carrying out the acid attack. 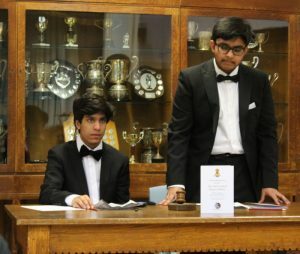 “There were also highly professional performances from Rukshaan Selvendira, of Year 11, as the macer [an official who keeps order in a Scottish court] and Karan Patel as court clerk. Jurors Denis O’Sullivan (Year 12), Euijin Lee (Year 11), Amaan Khan (Year 11), Saifullah Shah (Year 12) and Shakshum Bhagat (Year 12) performed their duties well and were a credit to the team,” Mr Robertson added. The trials were judged by well-known real-life judges, including Lord Leveson, currently the President of the Queen’s Bench Division and Head of Criminal Justice, who is best known for chairing a public inquiry into the culture and practices of the British press. 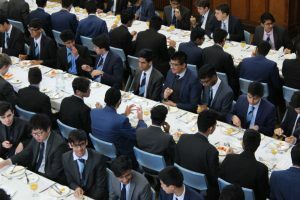 “Many of the barristers and judges present mentioned to Miss Dharmawardhane and me that they fully expect to see some of the boys being called to the bar one day in the future,” Mr Robertson said. 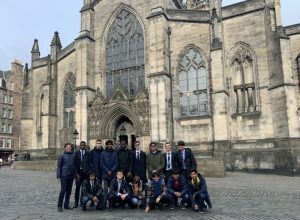 The boys took advantage of an opportunity to visit Edinburgh Castle and to walk along the Royal Mile to see statues of the philosopher David Hume and political economist Adam Smith, and buildings such as St Giles’ Cathedral, where they are pictured above. 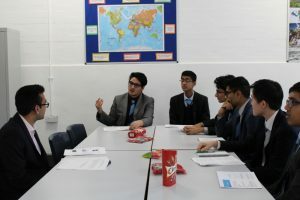 A young Elizabethan now forging a career in private banking with a global finance giant returned to the School to lead a Sixth Form discussion on Economic Geography. 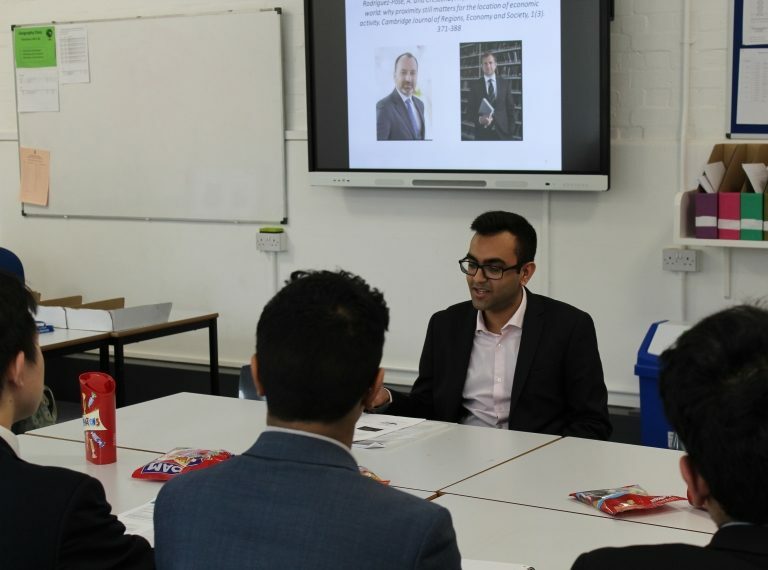 Hemang Hirani (OE 2008-15), who studied Geography and Economics at the London School of Economics and is now working for Barclays, gave a presentation to the select group of Year 12 geographers entitled The role of cities: an introduction to the field of Economic Geography. 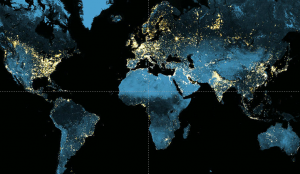 In a lavishly illustrated talk, Hemang included: a satellite picture of Earth by night; a world map showing the growing percentage of the planet’s population in urban areas since 1950, and colour- coded maps of the USA and India depicting the importance of cities in both advanced and emerging economies. He considered an influential academic paper on the topic, taking the boys through theoretical aspects such as labour market pooling, input-output linkages and knowledge spill-overs, as well as examining complex equations used by economic geographers. 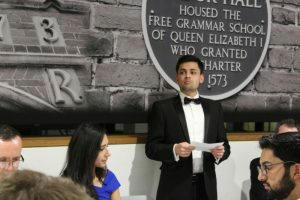 In his own time in the Sixth Form at QE, Hemang was a Senior Vice Captain. He has previously been involved in helping QE’s sixth-formers apply for Geography places at university. 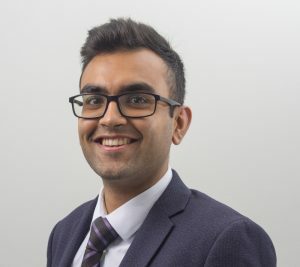 In addition, during his time at LSE, Hemang was a Widening Participation Mentor, undertaking weekly visits to state secondary schools in the City of London area to help underachieving groups of Year 12 pupils with university applications. He has been involved in volunteering ventures ranging from mentoring pupils at under-performing London schools to supporting poor cancer patients in Mumbai. After graduating, he undertook a number of internships, including three months with Swiss investment bank and financial services company UBS as a Summer Analyst. He joined Barclays Private Bank in a similar role in June last year. 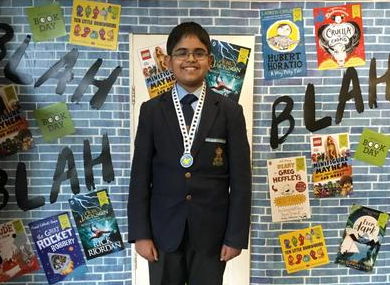 QE pupil and Channel Four’s reigning Child Genius Rahul Doshi ‘blew away’ both children and staff when he spoke at a literacy festival run by two local primary schools. 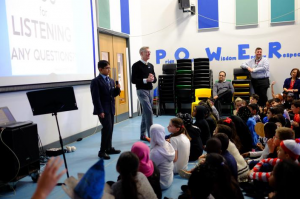 In an inspirational message, Rahul, who won the most recent series of the TV competition in 2017, told boys and girls at Edgware’s The Orion and Goldbeaters primary schools that academic success was “something to be proud of”, urging them to work towards it. Rachel Shear, Co-Headteacher of The Orion Primary School, paid tribute to Rahul when she wrote to QE to thank the School for allowing him to visit. “Rahul gave an absolutely wonderful talk at both of our schools and truly blew the children and staff away with his accomplishments. Orion and Goldbeaters, which are only half-a-mile apart, are part of the same federation and jointly hold an eight-week Word Up Festival. 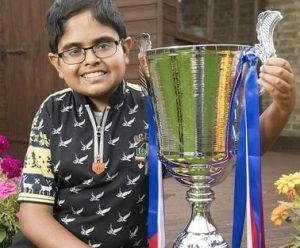 Rahul was invited by the schools after he was heard answering questions on Capital London’s breakfast show, where he has become a regular guest. Rahul’s speech was primarily about Child Genius and the learning techniques he employs, such as memorisation through creating ‘memory palaces’ and building stories personal to you in which to place the information you need to remember, or by finding connections between what you are learning to make it more interesting. In addition, he spoke about some of his key values, including always giving your best and being resilient. Having had his confidence boosted by his involvement with Child Genius, Rahul said he no longer finds speaking in public to be a daunting prospect, even to such large audiences. He said afterwards that he would be keen to deliver this message similarly in other schools. 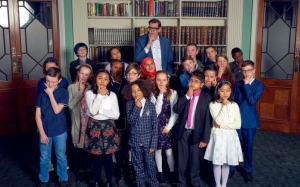 Rahul reflected on his appearance on a Child Genius Christmas special broadcast in December 2018 alongside comedians Jimmy Carr and Shazia Mirza, TV presenter Rick Edwards and newsreader Charlotte Hawkins. He commented that the celebrities were “quite clever” and that he was surprised by how much they knew. Ms Shear has made a donation to Great Ormond Street Hospital in Rahul’s name as a gesture of thanks. Year 8 House teams pitted their wits against each other in QE’s very own Maths Circus. 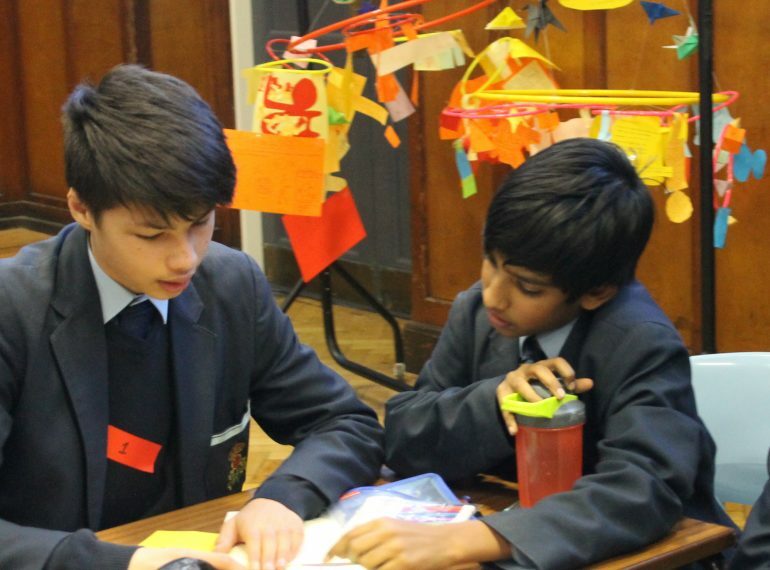 Inspired by the UK Mathematics Trust’s Maths Challenge events, the circus includes a number of rounds that involve both mathematical problem-solving and practical challenges. 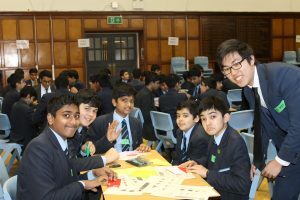 Each team was supervised by a Year 12 or 13 Further Mathematics A-level student, while sixth-formers also helped with the logistics of running the overall event. 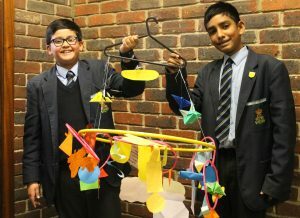 Assistant Head of Mathematics Wendy Fung said: “Now in its second year, the Year 8 Maths Circus follows on from the Year 7 Maths Fair, with the idea being to show boys that mathematical problems come in many different formats, as well as to help them to develop team-working skills. The morning of activities first involved a carousel of activities such as Crossnumber (a mathematical version of a crossword) and Origami. All teams then took part in the Relay, for which they had to combine speed of movement around the room with speed in solving a mathematical problem. The overall winners of the Maths Circus were Pearce with 569 points, beating second-placed Harrisons’ by just one point. Third place went to Broughton, on 549. Pearce were later presented with their certificate and the Robinson-Leong Shield in assembly. 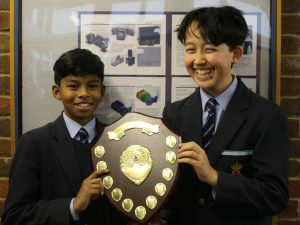 The shield is named after Oliver Robinson (a 2018 leaver) and current Year 13 pupil Samuel Leong, who both donated prizes they had won through the Jack Petchey Foundation to the Mathematics department. In a related challenge, all six Houses were also required to construct a hanging mobile. There were teams within each House, all of which were required to create part of the mobile, having been asked to prepare in advance by coordinating the different sections so that their mobile would encompass their ideas about the many facets of Mathematics. The prize for best mobile went to Leicester. This was also presented in assembly. 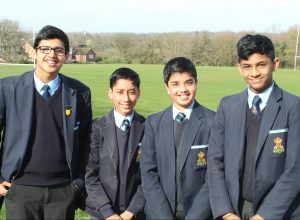 QE has continued its record of ever-improving performance in the Intermediate Maths Challenge, as the number of boys going through tops 170. After sitting the Intermediate Maths Challenge (IMC), which is run by the UK Mathematics Trust, 30 boys from Years 9–11 join a national élite of young mathematicians going on to participate in the Intermediate Maths Olympiad – up from 27 boys last year and 19 the year before. Across the whole country, only around 500 high-scorers in each year group are invited to join the Olympiad. A further 143 QE boys have qualified for the challenge’s other follow-on round, the Intermediate European Kangaroo. With 140 qualifying last year and 133 in 2017, this reflects another rising trend. Nationally, a total of 5,500 pupils across all three year groups are invited to sit the Kangaroo test papers. A total of 319 boys at the School took part in this year’s IMC. Of these, 172 were awarded gold certificates, 91 took silver and 39 bronze. The top 40 per cent of students nationally receive a gold, silver or bronze certificate in the ratio 1:2:3. Each school or college also receives a Best in School certificate. James Tan, of Year 11, was this year’s winner, with a score of 127 out of 135. He said that he had particularly relished the geometry questions. Next in Year 11 was Gurman Saini, with 122: “I enjoyed getting my head around the riddles,” he said. He was closely followed by Hari Gajendran, on 121. The Best in Year 10 accolade went to Dan Suciu, with 125, followed by Abhinav Santhiramohan, with 115. 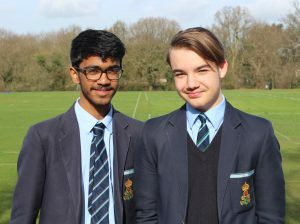 Best in Year 9 was Ansh Jassra, scoring 119 – “I like the blend of complex, challenging Maths and fun, creative problem-solving,” he said – and second place went to Arnie Sahi, on 116. The names of the Intermediate Mathematical Olympiad papers are: Cayley, Hamilton and Maclaurin for Years 9, 10 and 11 respectively. The Kangaroo papers, which are sat by pupils from more than 30 countries, last one hour and feature 25 multiple-choice questions. A 24-hour digital clock shows the time in hours and minutes. How many times in one day will it display all four digits 2, 0, 1 and 9 in some order? 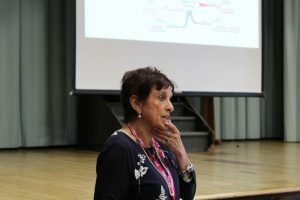 Dame Helen Hyde, former headmistress and now a leading social justice campaigner, encouraged QE pupils at the Year 12 Luncheon to say no to hatred in all its forms and to make a positive difference by taking action. 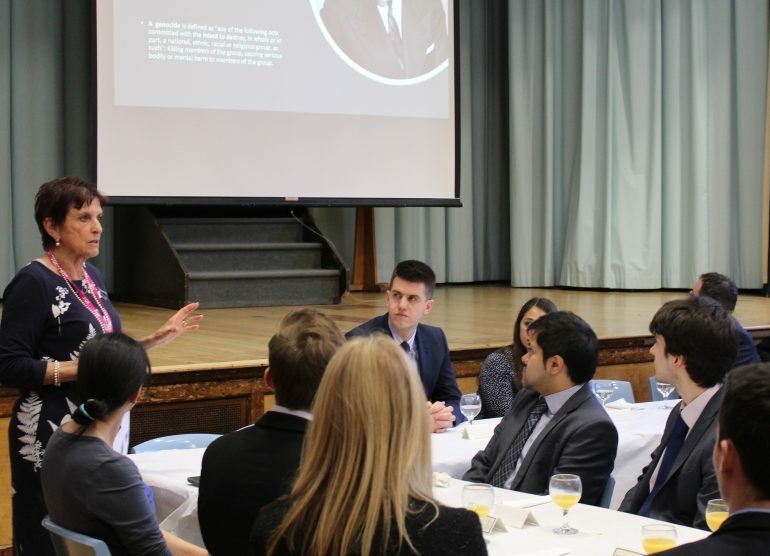 Dame Helen was the guest speaker at the annual meal, which is arranged to give sixth-formers experience of the sort of formal social occasions they will experience at university and in their careers beyond. A recognised national education leader who mentored other heads and school leadership teams, she left Watford Grammar School for Girls, where she had been Headmistress for 29 years, in 2016, because, as her own website puts it, “she felt she could no longer be a bystander”. She was made a Dame Commander of the British Empire (DBE) for her services to national state education and Holocaust Education in 2013. Dame Helen was appointed to the Holocaust Commission established by Prime Minister David Cameron in 2013-14. Last year, she received an honorary doctorate from the University of Hertfordshire. 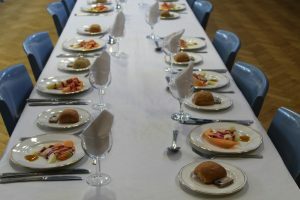 The luncheon, a three-course meal, was supported by Friends of Queen Elizabeth’s volunteers and Year 9 helpers. As is customary, a number of toasts were made prior to Dame Helen’s address. 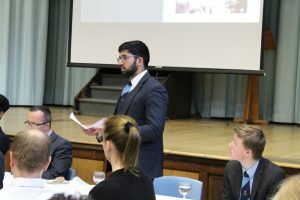 School Captain Bhiramah Rammanohar compèred the event, while Senior Vice-Captain Fozy Ahmed delivered the vote of thanks. In her presentation, Dame Helen explored aspects of the Holocaust, in which members of her own family were murdered. She considered its unprecedented nature, the events that led up to it in Nazi Germany, the widespread complicity of many in Germany and occupied lands across Europe, and the reasons why the world powers failed to intervene. Her family were originally from Germany, but some managed to escape abroad. Her father went to South Africa in 1936, where she was later born. She emigrated to Britain in 1970. Her presentation also looked at South Africa’s history of Apartheid, as well as at genocides from that of the Armenians in the early 20th century through to recent events in Darfur in the Sudan and among the Rohingya from Myanmar. She spoke about the work of Refugees to Recovery (R to R), which she set up with Tony Rindl, Vicar of St Mary’s Church, Watford. R to R works with other organisations to collect items badly needed by refugees. Her work with Holocaust survivors led to Dame Helen’s interest in the Rwandan genocide of 1994, when 1 million people died in 100 days. She is an active patron and co-director of the Rwandan Sisterhood, which brings together Rwandan women uprooted by the genocide and raises funds to provide ‘Mama packs’ to expectant women in Rwanda and other African countries. She finished her presentation to the boys with a challenge, calling on them to consider “your decisions, your words and your actions” and to “be an upstander”, taking action to help with the campaigns and charities she had outlined. 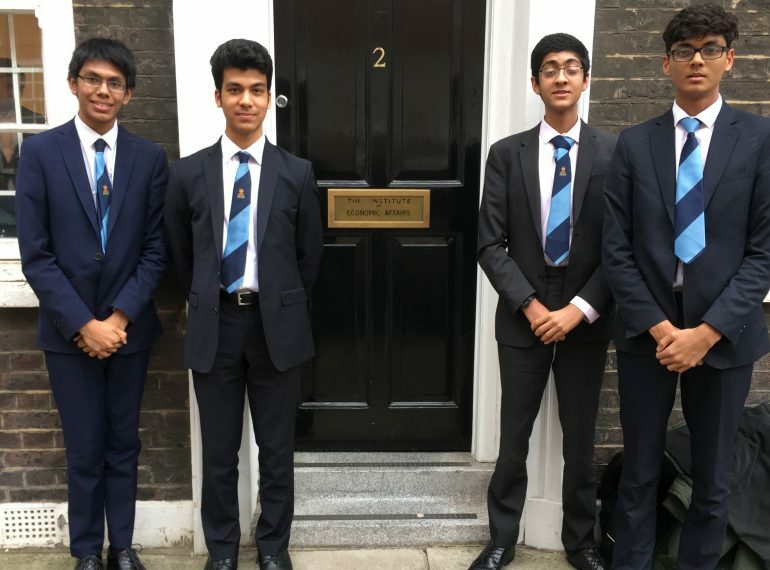 A QE team won praise from the judges for their multi-faceted presentation at the final of an Economics competition run by one of the country’s oldest thinktanks. 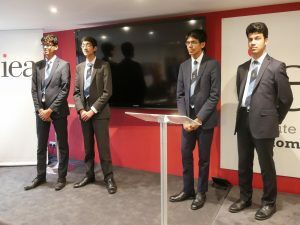 The team of four sixth-formers, including the co-presidents of QE’s Economics Society, were shortlisted among the final 12 teams for the final of the Budget Challenge run by the Institute of Economic Affairs (IEA). 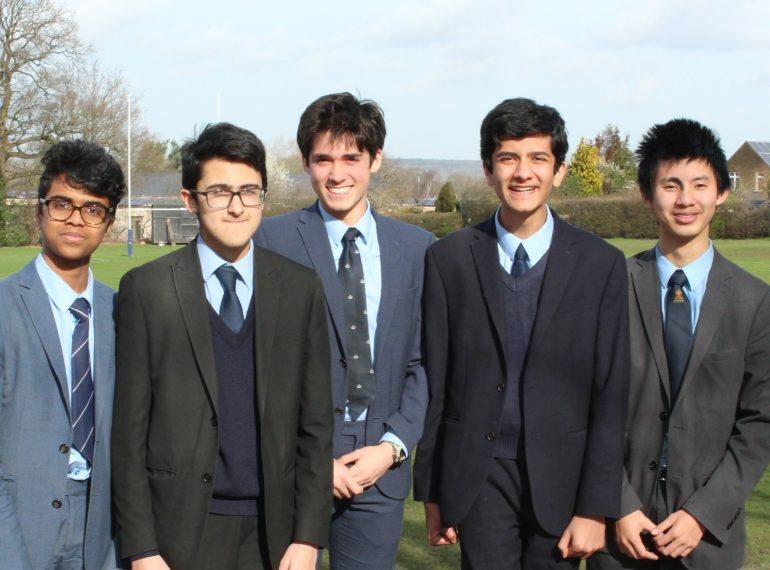 The QE team chosen from Year 12 by Mr Uduwawala consisted of Economics Society co-presidents Rishi Shah and Hanif Gofur, together with Neel Shah and Rushil Shah. They were competing against schools including Harrow, Repton and North London Collegiate School. For the challenge, each team had to prepare a budget for the UK in the coming financial year, with taxation and spending policy, as well as more briefly analysing the macroeconomic conditions and setting out a broad policy and strategy in response to these. The final, which was held at the IEA’s Westminster base, began with an introduction from Dr Davies, who recently delivered a lecture at QE on game theory. He discussed the history of the IEA, which was founded in 1955 based on a vision from economist Friedrich Hayek and now reports on economic affairs. 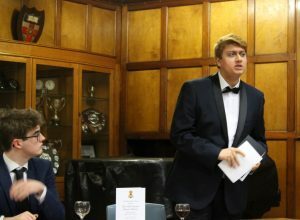 Then the competition began, with each of the 12 teams being asked to give a ten-minute presentation on their budget, followed by a ten-minute cross-examination by the judges. Soon after lunch – a ‘grand buffet’ – came the presentation for the QE team. She argued that democracy isn’t the realisation of an ideal society; instead it is more of a process. She then moved onto the relationship between democracy, the rule of law and the judicial system. After all the presentations, there was a talk from Dr Kristian Niemietz, the IEA’s Head of Political Economy, who explained some of the key phrases frequently heard in the EU debate. He noted that the implications of Brexit will be on trade, immigration and regulation, as leaving the customs unions and the European single market would end the free movement of people. He used the analogy that the EU is not like being a Netflix subscriber, where either one is, or is not, subscribed. Instead, the EU is a great deal more complex, with many different parts and subsections, and one can be in each of them without being in all of them. 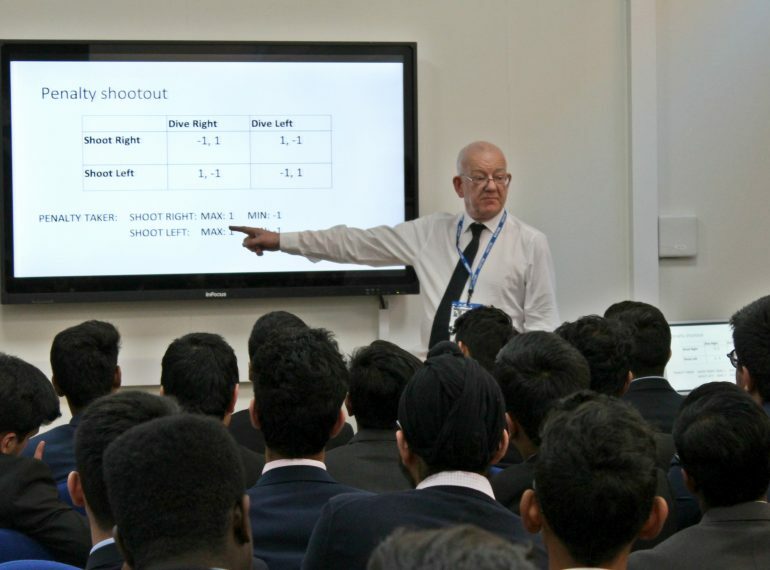 A visiting historian and economist set out how game theory applies across a very wide range of human activity in a lecture to senior boys – while also giving his own views and predictions about Brexit. Dr Steve Davies is Head of Education at the Institute of Economic Affairs and has previously held academic roles in both the UK and US. He has authored several books, including Empiricism and History (Palgrave Macmillan, 2003) and was co-editor with Nigel Ashford of The Dictionary of Conservative and Libertarian Thought (Routledge, 1991). In his lecture to senior boys, he illustrated applications of game theory in football, TV game shows and in oligopolies (where a market or industry is dominated by a small number of large sellers). Game theory is the study of mathematical models of strategic interaction between rational decision-makers. Himself a keen Manchester City fan, Dr Davies chose the penalty shoot-out at the end of the 2008 Champions League final between City’s local rivals Manchester United and Chelsea to illustrate game theory in the sport. United won the match after the team’s goalkeeper Van der Sar first pointed to his left, but then dived to his right, correctly guessing that Chelsea’s Nicolas Anelka would shoot that way. Van der Sar saved and United duly won European football’s top prize. Dr Davies also looked at game theory in the game show, Golden Balls, and at the dilemma faced by two suspects interrogated for crimes, where they must choose whether the best thing for themselves is to confess, stay silent or betray the other prisoner. Turning to oligopolistic markets, he examined the issue of such markets involving just two firms. Both firms could benefit from both having high prices, but one will always try to undercut the other firm by lowering prices, he pointed out. This problem could be overcome by collusion, although that is illegal. Dr Davies also digressed to talk about Brexit. Stating that there was an impression of widespread panic about it within business, he blamed the media because he said they were predicting – incorrectly, in his view – that desperate shortages are inevitable. In terms of companies stockpiling, this is usual in any time of uncertainty and is not uniquely or solely about Brexit. Alluding to the current febrile political atmosphere, with much plotting going on in Westminster pubs, he noted the similarity to the 1885 general election, the first to be held after an extension of the franchise which meant that for the first time, a majority of adult males could vote. There would be, he predicted, no second referendum, since a majority of Parliament is against it. A cross-party deal will form – to secure outcomes such as ‘Norway plus’ or continuing membership of the customs union – but he forecast that major splits will continue to happen as the March 29th Brexit deadline approaches. 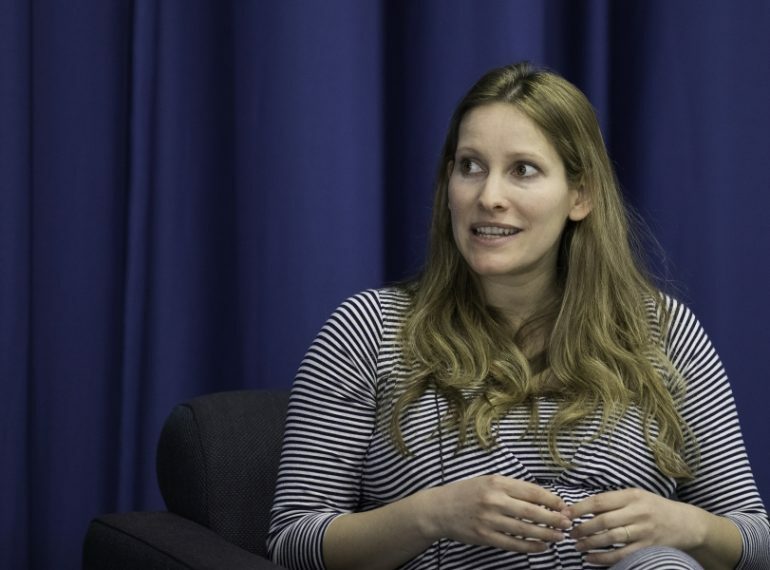 Leading activist and writer Laura Bates impressed QE sixth-formers with a wide-ranging lecture on modern feminism. 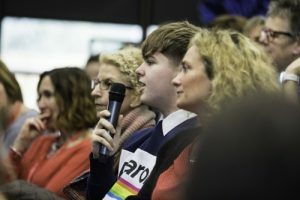 The founder of the Everyday Sexism Project covered topics including definitions of feminism, transgender matters, the approach feminists should adopt to cultures elsewhere and the advice that should be given to young men in relationships with women. 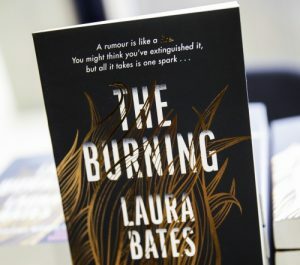 She also discussed her new Young Adult fiction book, The Burning. After an invitation from hosts St Albans High School for Girls, a dozen Year 12 A-level Politics students attended the lecture, accompanied by Head of Year 12 and History & Politics teacher Lottie Coleman and Head of Politics Liam Hargadon. The School has selected feminism as an option within the A-Level Politics core syllabus. 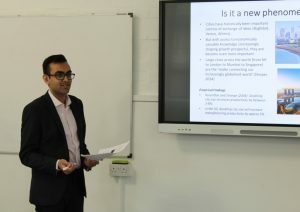 One of the QE sixth-formers, Rushil Shah, praised Ms Bates’ “well-articulated and convincing talk…which was not repetitive or droning at all,” adding that he had been impressed by her use of statistics. His classmate, Leo Kucera, praised her for addressing male stereotypes in society and for “confidently and accurately answering questions”. 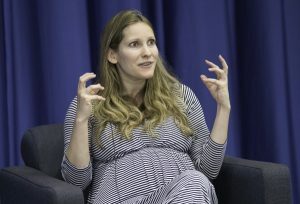 Ms Bates started the Everyday Sexism Project website in 2012, five years after graduating from Cambridge with a degree in English Literature. The aim of the site is to document examples of sexism from around the world. She spoke initially of her own experiences of sexism, including a Cambridge don who wore a black armband on the anniversary of women’s first admission to the university. To illustrate her claim of the inequality facing women, she cited the fact that there are more men called John leading FTSE100 companies than women! She stressed the need to discuss sexism and feminism with young men in relationships, saying that the suggestion sometimes made that this is a ‘minefield’ area is actually insulting to young men. Regarding trans matters and how feminism applies in this area, she pointed out that women are not an homogenous group anyway, so the variety of experience seen among trans people should not be an issue. Ms Bates felt that it is not the job of western feminists to impose their ideals in other parts of the world; they should instead concentrate on giving feminists from other cultures a platform. Workplace gender quotas – the current situation is not a true meritocracy, so quotas are not inherently unfair, she said. They might speed up the process of attaining equality as a short-term step, alongside other measures. Besides Leo and Rushil, the QE attendees were: Alex Beard; Chris Hall; Senan Karunadhara; Tohgo Kimura; Mehdi Reza Lilani; Aditya Mukopadhyay; Josh Osman; Ryan Ratnam; Oscar Robinson and Teg Singh.